Made to Order. Ship in 3 days. 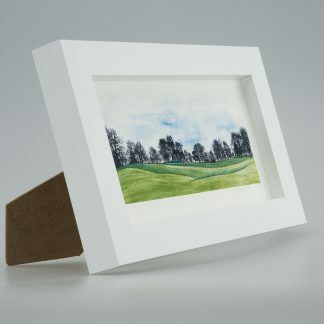 Individually made in the UK by the artist and personally signed just for you. 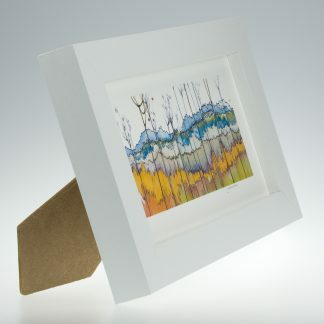 Printed onto beautifully textured fine art watercolour paper. Made in Somerset from non-wood pulp on a traditional mould machine. Printed using ChromaLife100+ inks. Approximately 40 years light fast when displayed behind glass. 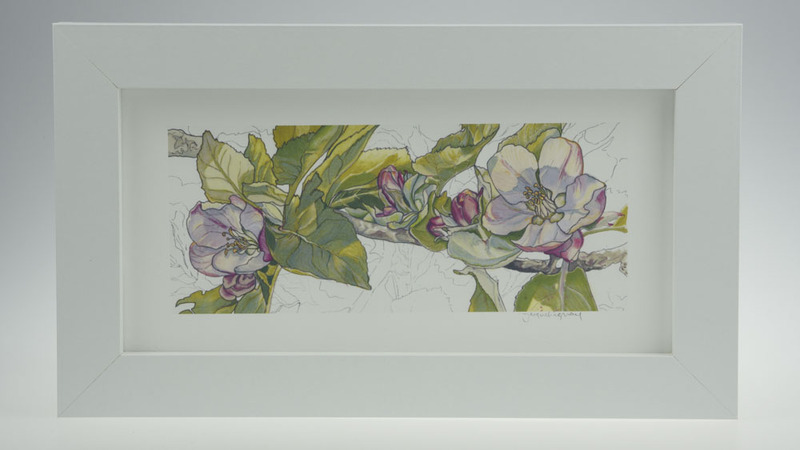 Presented in a bespoke frame by frame makers local to the artist. 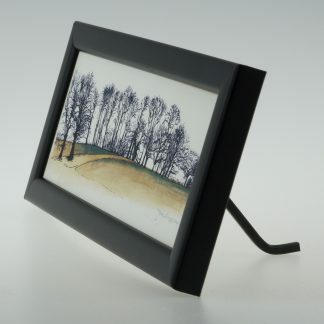 In a 2.7×2.7cm thick MDF frame. 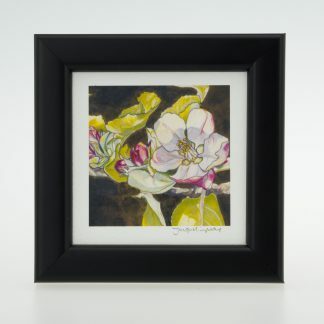 In a choice of black or white satin frame finish. In the frame size of your choice. Dimensions given are external frame sizes. Presented behind glass and sealed on the back with framer’s tape. 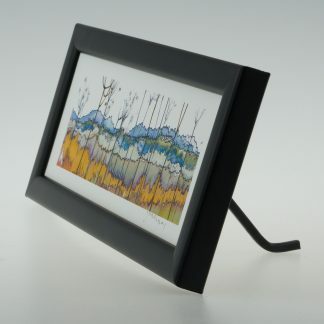 Ready for wall mounting or free-standing display. 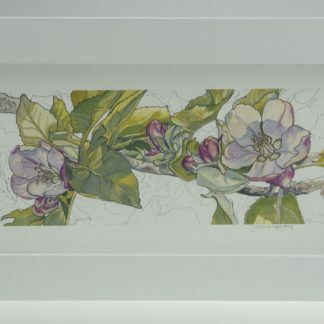 A digital reproduction print, from an original design created on paper. Made using a flatbed scanner and ink jet printer. Available for delivery to anywhere in the UK. Will require a signature on delivery. Please be aware that the colours you see on your monitor may differ slightly from the actual colours of the print. All art prints and images on this website are protected by copyright. All prints are made to order and dispatched within 3 working days. You will receive an email confirmation at time of dispatch. For more pressing requirements, please refer to our Express Shipping option below. Deliveries are usually made by Royal Mail postal service. Orders sent parcel post will require a signature on delivery. Orders sent letter post will not require a signature on delivery and should pop straight through your letterbox. Please refer to our Packing and Delivery Chart above for further details. Larger consignments might be dispatched by courier. Delivery method will be confirmed at time of dispatch. Goods will be dispatched next working day and shipped first class post. Orders must be placed before 12 noon and express shipping selected during the check out process. PLEASE NOTE: If your order is placed after 12 noon we cannot guarantee that your order will be ready for dispatch the following day. All items are made to order and due to our production process your print might not be ready in time. Please allow 1-2 working days for delivery from date of dispatch. This is an estimated delivery time provided by Royal Mail. From dispatch date please allow 2-3 days for second class post and 1-2 days for first class post. These are estimated working day delivery times provided by Royal Mail. How are my shipping costs calculated? Packing and delivery is calculated at cost, based on weight and dimensions. You will only be charged at checkout for the packing & delivery cost of the largest item in your basket. How may I return an item? Notify us within 14 days of delivery, quoting your order number, and ship back to us within 30 days of delivery. What if I am not happy? Great care is taken to produce each of our prints, but if you are unhappy with your purchase, please contact us immediately so we may resolve matters as soon as possible. What if my order is received damaged? Great care is taken to package your order to make sure damage does not occur in transit. However, if this does happen please contact us immediately, with a clear picture of the damaged product.